The lightest cooking fuel adds nothing to your pack weight - that is, if you don't mind gathering fire wood, making a cook fire, and tending to it while cooking your meal. But...if you're lazy like me, or you just hike until you're tired and hungry (OK that sounds more like me! ), there's a good chance you prefer a simpler approach. Pour your dehydrated meal right into your cook pot. In this example, it's black bean soup, instant white rice, and some Delight Sauce. Add enough water to cover your meal by about half an inch, then set aside. The lightest, most efficient fuel I've found is Esbit. I made my own titanium version of Trail Design's Gram Cracker Esbit stove. Their little 0.10oz stove is great, but since the Esbit fuel turns to liquid while burning, it runs down and fills the deep grooves with fuel which becomes solid when it cools. This creates additional work for you to scrape off the residue before you can disassemble and store the stove. My one piece design eliminates the grooves and almost never needs cleaning. I store it in a tiny MYOG cuben fiber sack to keep the dirty little stove away from everything else in my kitchen. Esbit can be a little difficult to light, but there are tricks to making it easier. A few drops of denatured alcohol lights it very quickly, but if you're using Esbit, you're probably not carrying alcohol. I've even tried alcohol hand sanitizer, which works OK, but I don't tend to carry it either. My favorite method is to take my tiny pocket knife and scrape a small groove into the top of the cube at one end, creating a small pile of powder on the top. This Esbit powder ends up being relatively easy to light with your mini bic. Bring it to just a boil, stir, cover, and blow out the flame. Let it stand for about 5 minutes to finish "cooking". As compared to bringing water to a rolling boil (for FBC cooking), this method takes about half the time, which of course uses less fuel. After cooking a dinner for two, I typically end up with around half of my Esbit fuel cube left. My experience is we use less than one Esbit fuel cube (0.5oz) per day for two people, making a hot breakfast and dinner each day. This is about as close as you can get to carrying no fuel with the added bonus of not having to tend to a wood fire the entire time you are preparing your meal. 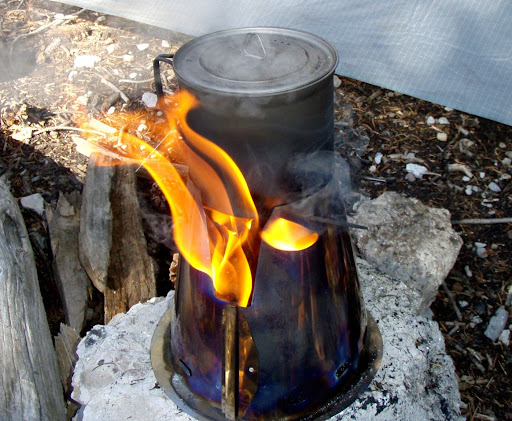 My Trail Designs 1.3 liter Sidewinder Ti-Tri stove leaves me the option to use it as a wood burning stove, which I have as a backup to Esbit. That way I don't need to carry any extra "just in case" fuel. Nice post. I never bring my water to a boil when doing FBC since I use treated water in the pot, but I think you're correct in that most people do wait on a boil. I recently picked up the folding titanium esbit stove and like it pretty well. I have only used the esbit around the house testing it out, but I am already a big fan of the fuel. However, I would like to get the sidewinder cone set for my .9L ti cook pot. I love that I can use wood, esbit or alcohol with it. Good post.The problem with hiking in the mountains and hills of the UK,are the complete lack of trees other than in the valleys. This means you would have to carry the firewood. Pity, there something very comforting about using wood. I walk in the Spanish Sierra Nevadas and , with no trees, fuel might seem to be non existent. What we do have is low growing spiky plants, and thyme. You can often find dry roots and grass heads. and you need surprisingly little to boil a cup or two of water (see Youtube 'Mulhacen in February'). In principle, I am against collecting wood for fires but that is another topic for a discussion. I like Esbit fuel. Good tip on how to light it. Thanks. Nice post. I've been doing this technique more and more, moving up to a larger ti pot and cooking meals in the pot over wood fire has me gradually moving away from the freezer bag thing, which has it's positives and negatives, the negative being slimy food bags. I agree in some areas it doesn't make sense to gather wood for a fire, but if you've ever made a cook fire in a Ti-Tri or other wood burning backpacking stove...it takes very little fuel. Just a few twigs to make your meal, so the impact is very little IMO. Did I understand you correctly? Do you use one Esbit tab to cook two meals i.e. breakfast then dinner? If so, how do you extinguish the tab so it can be use later? Hi Anon, that's correct, I use about half an Esbit for each meal. I simply blow it out and let it cool, then later I start it the same way I did the first time. Also I store the used Esbit right in my little Ti stove, and then inside a little stuff sack I made to keep from getting my cook pot dirty. Very nice John- I too have converted to Esbit for warmer weather cooking and have found 1/2 a cube is enough and boiling water isn't necessary. I treat all of my water even for cooking to avoid longer burn times and save on fuel. I know exactly what you mean about the grooves on Gram Cracker stove filling up with residue, that's my only complaint about the stove. I would be very interested in seeing how you made your version. JERMM, it sounds like I need to do a MYOG post on the little Esbit stove. In the mean time, it was pretty simple and you can make most of it out in the above photos I think. I took a thin piece of titanium foil and cut it into kind of a plus sign, the folded two tabs down for the feet and the other two up. Works just like the TD version without the fuss of cleaning out the grooves. Good choice of pot. The Evernew 1.3 liter pot is wide for its volume, which make it more efficient than a narrow pot. For lighting esbits, I've taken to using WetFire tinder tabs. It loses simplicity points because it's another item you need to put it, but it's really light, and lights INSTANTLY, so I can take paper matches instead of a Bic. Thanks for the post John. Another thing you can do rather than making a new "gram cracker" is to just turn the Gram Cracker you have upside down! It will perform all of it's other functions and the approach John suggests here....no change to your gear! Glen, great tip on the WetFire tabs. I carry them as an emergency firestarter. You could also start them with a flint steel, which I would probably carry as a backup any way in case the paper matches get wet. Agreed your Gram Cracker would work well upside down, but I still like the simplicity of a one piece design. By the way, I just got back from 4 days on the Wonderland Trail using your 1.3 liter Ti-Tri Sidewinder system with my method described above, and I was able to get 4 meals out of just 1 Esbit tab! The temp was around 75F and elevation around 2,500-4,500'. I've not heard of this type of performance out of any other stove system! It really only depends on how much water you say you are boiling/near boiling rather than how many meals. So, how much water are you boiling on 1 tablet? Typically a liter per tablet is the limit. I'm not boiling water, just rehydrating then heating meals. With my method I heat 3-4 cups of water plus food for two with 1/2 an Esbit. Again, not boiling. I like your method for cooking but what if you also want coffee in the morning? If I have coffee in the morning, I will heat some water before I make breakfast. A cup of water almost boiling only takes a few minutes, and I pour it into my water bottle. My merino glove liner works great to insulate my hand from the hot bottle. I find that on really difficult hikes I don't drink coffee, but I really enjoy it on easier days. Starbucks Via - what a great invention! I like your views that Freezer bags are considered food grade plastic. While using them for eating out of is not a claimed use on the bag's box, most major manufactures have microwaving as a use and temperatures easily exceed boiling point in a microwave. Freezer Bag Cooking isn't just for outdoor food! It also is great to use in emergency preparedness kits. Those "72 hour" preparedness kits that are talked about so much in the news, can be filled with good food that you prepared. From natural disasters to day's long power outages, you need to provide for you and your family, FBC can help. Freezer Bags can be used as a Storage, Waste container, Water carrier, Emergency float, Pillow. Thanks a lot. Have you checked your Biosphenal A levels, pouring boiling water into a plastic water bottle would not be recommended. How do you cook pasta and sauce with only one pot? I thought you would need one pot to boil the pasta and the other to heat the sauce. Resorting to such energy savers is a great step and contribution towards preserving the world energy.